Using regional trains or bus lines offered by Deutsche Bahn you can reach the main stations of the following towns near the park: Bad Wildungen to the east, Korbach to the north, and Frankenburg to the southwest. Each of these towns offers bus services right to Kellerwald-Edersee National Park. Coming from the northwest, take the A44 to the Diemelstadt exit and follow signs towards the park. Coming from the south and east, take the A7 to the Homberg exit, and from here you can follow signs to the park. From the larger towns of Bad Wildungen, Korbach, and Frankenburg (all easily accessible by train), there are bus services that will take you directly to various park destinations. Stroll past babbling creeks, meadows and rocks, and stand among 5735 hectares of Kellerwald-Edersee National Park's magnificent, uninterrupted beech trees- one of the last forests of its kind in Central Europe. Belonging to the "Ancient German Beech Forests of Germany", the beech trees in this park have been protected as a UNESCO World Natural Heritage site since 2011. Enthusiastic and knowledgable park rangers offer excursions and educational programs for both children and adults, and they are eager to share their passion for Hesse's first national park with you. If you would rather explore the beauty of the beech trees on your own, go on a hike on one of their 20 well-marked circular hiking paths accessible from 13 different starting points around the park. These take about half a day to complete, and you can stop by one of the many info centres in the region for trail maps. If you look close enough, you may even be able to spot one of the 15 different species of bat (out of 24 total in Germany!) that calls this park their home. For those of you who prefer to be on two wheels, you can even bike through the park on certain designated cycling routes! Tip: Check out the TreeTopWalk, or "Baumkronenweg", within the park, where elevated paths will take you high up into the trees. It is worth the price to share the views that usually only squirrels get to see! Get up-close and personal with wild animals such as red deer, lynx, wolves, and many others in Kellerwald-Edersee's Wild Animal Park, or "Wildtierpark". You can even pet some of them in the Wildtierpark petting zoo! A great place to bring the kids. 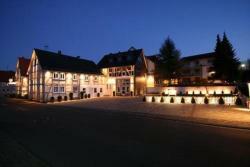 Located in Bad Wildungen, the historical town of Northern Hesse, this hotel offers comfortable rooms and attentive service. Our new and dream-like spa and wellness paradise Quisisana Spa is an island of calmness and relaxation on over 600m². This family-run, 4-star hotel offers a variety of free spa facilities including an outdoor pool. The restaurant serves fresh, Hessian cooking. 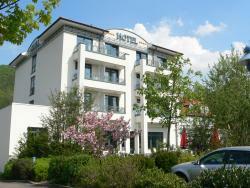 The hotel is in the spa town of Bad Wildungen. Welcome to the Landhotel Kern, the first theme hotel in Hesse, beautifully located in the hiker’s paradise of the Kellerwald Forest and Lake Edersee.